The American love affair with drones (officially called unmanned aerial vehicles) extends to both military and law enforcement uses. 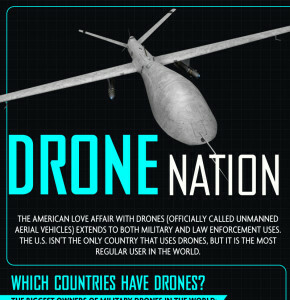 The U.S. isn’t the only country that uses drones, but it is the most regular user in the world. Note: Numbers are minimums, as many countries’ levels are unknown. Global spending on unmanned aerial vehicles will surge in the next 10 years, rising by a predicted 128 percent. The U.S. has been widely criticized for its use of drones to fight terrorism. In Pakistan alone, the U.S. has launched thousands of drone strikes since 2004. Many Americans assume these devices are used only to launch offensives in foreign countries. That’s a false assumption. Over the years, dozens of agencies across the U.S. have used drones for a variety of purposes, many of them classified.